Our favorite mug is back! We’ve been wanting to get these mugs back in stock for almost a year now, ever since our first batch sold out! But it hasn’t yet happened because of an increased minimum order requirement from the European family business we partner with who makes each one by hand. 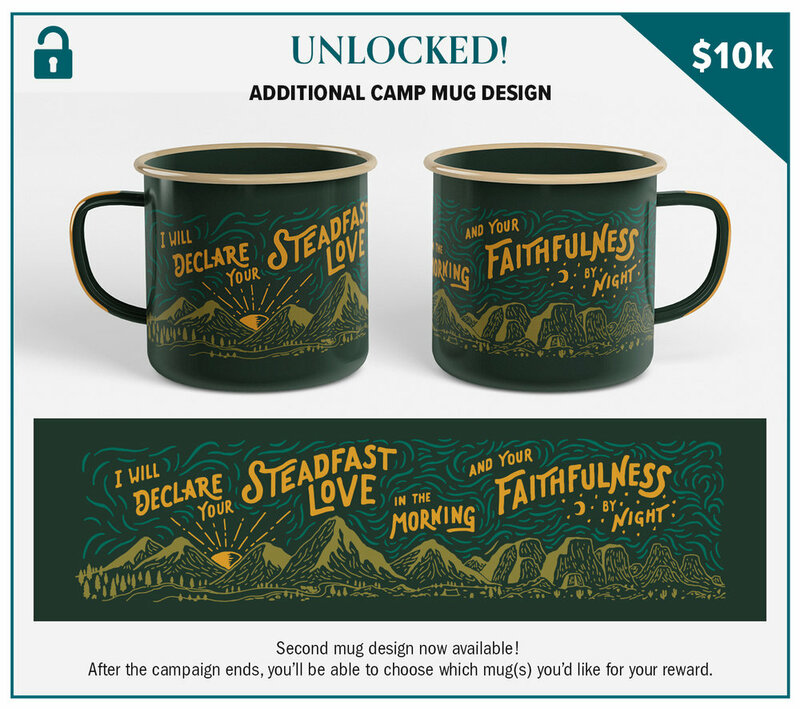 So, we’re super excited to announce that we just launched a Kickstarter campaign to pre-order the mug (along with some other special reward options)! Our goal is to have an entire line of Scripture enamelware and we’re hoping this will be just the start of that. So we need your help in spreading the word about this project! Many have heard the phrase “Preach the Gospel to yourself every day.” This mug was created with that in mind. Each product we create has a lot of thought behind it. Not only is it important to us that it be designed well, but also that it will serve a practical and purposeful function in the treasuring of God’s Word. These 17oz enamel mugs are incredibly durable, making them perfect to bring along with you wherever you go: from the kitchen, to the office, all the way to the backcountry. Not only is it beautifully crafted, but it is non toxic and safe for the dishwasher, the oven, and even the campfire! Being a small family-owned and operated business (it really is just Carly and me behind the scenes! ), we are truly grateful for your continual support and encouragement of Scripture Type. It means so much to us. We’re so excited at the possibility of having these enamel mugs in our shop again and would really appreciate your help in spreading the word!